Android's switch to LLVM/Clang as the default platform compiler in Android 7.0 opened up more possibilities for improving our defense-in-depth security posture. In the past couple of releases, we've rolled out additional compiler-based mitigations to make bugs harder to exploit and prevent certain types of bugs from becoming vulnerabilities. In Android P, we're expanding our existing compiler mitigations, which instrument runtime operations to fail safely when undefined behavior occurs. This post describes the new build system support for Control Flow Integrity and Integer Overflow Sanitization. A key step in modern exploit chains is for an attacker to gain control of a program's control flow by corrupting function pointers or return addresses. This opens the door to code-reuse attacks where an attacker executes arbitrary portions of existing program code to achieve their goals, such as counterfeit-object-oriented and return-oriented programming. Control Flow Integrity (CFI) describes a set of mitigation technologies that confine a program's control flow to a call graph of valid targets determined at compile-time. While we first supported LLVM's CFI implementation in select components in Android O, we're greatly expanding that support in P. This implementation focuses on preventing control flow manipulation via indirect branches, such as function pointers and virtual functions—the 'forward-edges' of a call graph. Valid branch targets are defined as function entry points for functions with the expected function signature, which drastically reduces the set of allowable destinations an attacker can call. Indirect branches are instrumented to detect runtime violations of the statically determined set of allowable targets. If a violation is detected because a branch points to an unexpected target, then the process safely aborts. Figure 1. 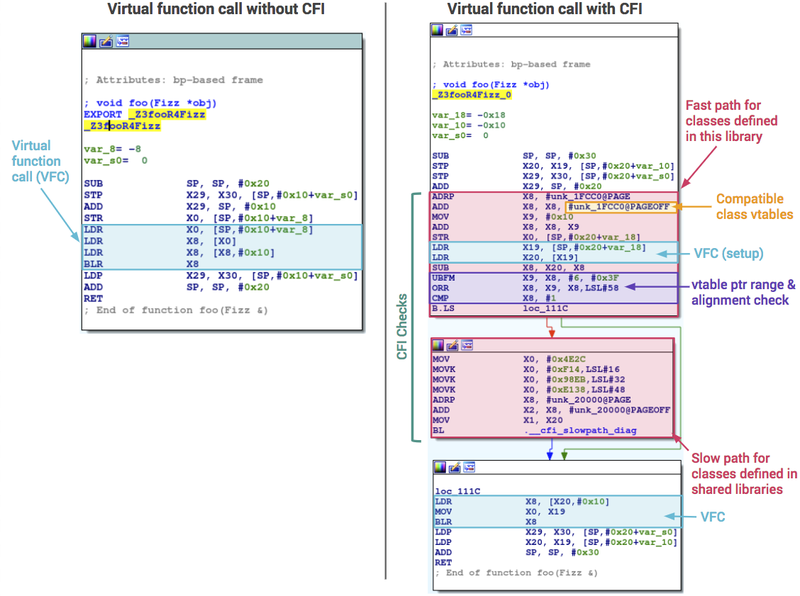 Assembly-level comparison of a virtual function call with and without CFI enabled. For example, Figure 1 illustrates how a function that takes an object and calls a virtual function gets translated into assembly with and without CFI. For simplicity, this was compiled with -O0 to prevent compiler optimization. Without CFI enabled, it loads the object's vtable pointer and calls the function at the expected offset. With CFI enabled, it performs a fast-path first check to determine if the pointer falls within an expected range of addresses of compatible vtables. Failing that, execution falls through to a slow path that does a more extensive check for valid classes that are defined in other shared libraries. The slow path will abort execution if the vtable pointer points to an invalid target. With control flow tightly restricted to a small set of legitimate targets, code-reuse attacks become harder to utilize and some memory corruption vulnerabilities become more difficult or even impossible to exploit. In terms of performance impact, LLVM's CFI requires compiling with Link-Time Optimization (LTO). LTO preserves the LLVM bitcode representation of object files until link-time, which allows the compiler to better reason about what optimizations can be performed. Enabling LTO reduces the size of the final binary and improves performance, but increases compile time. In testing on Android, the combination of LTO and CFI results in negligible overhead to code size and performance; in a few cases both improved. For more technical details about CFI and how other forward-control checks are handled, see the LLVM design documentation. For Android P, CFI is enabled by default widely within the media frameworks and other security-critical components, such as NFC and Bluetooth. CFI kernel support has also been introduced into the Android common kernel when building with LLVM, providing the option to further harden the trusted computing base. This can be tested today on the HiKey reference boards. The UndefinedBehaviorSanitizer's (UBSan) signed and unsigned integer overflow sanitization was first utilized when hardening the media stack in Android Nougat. This sanitization is designed to safely abort process execution if a signed or unsigned integer overflows by instrumenting arithmetic instructions which may overflow. The end result is the mitigation of an entire class of memory corruption and information disclosure vulnerabilities where the root cause is an integer overflow, such as the original Stagefright vulnerability. Because of their success, we've expanded usage of these sanitizers in the media framework with each release. Improvements have been made to LLVM's integer overflow sanitizers to reduce the performance impact by using fewer instructions in ARM 32-bit and removing unnecessary checks. In testing, these improvements reduced the sanitizers' performance overhead by over 75% in Android's 32-bit libstagefright library for some codecs. Improved Android build system support, such as better diagnostics support, more sensible crashes, and globally sanitized integer overflow targets for testing have also expedited the rollout of these sanitizers. Moving forward, we're expanding our use of these mitigation technologies and we strongly encourage vendors to do the same with their customizations. More information about how to enable and test these options will be available soon on the Android Open Source Project.